The Zanzibar Red Colobus is endemic to Tanzania. Tanzania is known for its tapestry of lush forests, expansive grasslands and tropical beaches, and abundant and diverse wildlife. Its coastal forests are part of the Coastal Forests of Eastern Africa biodiversity hotspot - a place recognised for its wealth of wildlife but threatened with destruction, making it a high priority for conservation efforts. These forests are home to hundreds of endemic plant and animal species - ones that aren't found anywhere else in the world. 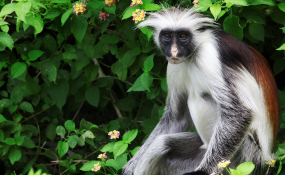 For example, there are five endemic mammals - including the Zanzibar Red Colobus - five endemic birds, six endemic amphibians and three endemic reptiles, as well as 325 endemic plants. More than 300 other species are shared only with the nearby Eastern Arc Mountains. In our paper we found that biodiversity - and the level of endemic species - is exceptional by global standards. We show that many endemic species are threatened with extinction. This is due to increasing human-use pressures as well as emerging mining, gas and oil exploration. Habitat loss and degradation has continued and the space remaining for the endemic species is shrinking. It's now often confined to government protected areas and lands managed for conservation by villagers. By mapping forest loss we can see that there are areas that are some distance from the major coastal towns - Dar es Salaam and Lindi. The lack of recent forest loss closer to these cities is because it's already been cleared and replaced with urban areas or farm land. Clearance of forest has spread like a wave from these cities into more rural areas. Millions of people in Tanzania rely on natural resources - clean freshwater, healthy forests and abundant wildlife - for food and income. And, the destruction of Tanzania's coastal forests to support the growing population is putting huge pressure on the natural environment. The main use of forests by people has been as a source of farmland. Tanzania's economic development in the coastal region is highly dependent on agriculture. Freshly cleared forest is more fertile than established farmland. This has led to more clearance of unprotected forest patches. The need for fertile soil that is close to water courses puts coastal forest patches under even more pressure. Now, almost no forest patches remain in the coastal areas of Tanzania unless they are protected in government - or village-managed reserves, or are within sacred forest or burial sites for local villagers. The forests and woodlands in the coastal areas have also been used as a source of timber and poles for construction, and as a source of energy - either as firewood in rural areas or converted to charcoal for transport to the growing cities and urban areas. About 90% of Tanzania energy generation comes from wood and charcoal and is a vital source of income to some rural villages. But this has an impact on many of the endemic species. To deal with these challenges - protecting this unique habitat while ensuring people have the resources they need to survive - reserved areas have been created by central and local governments, as well as local communities who are promoting better management. There is also a gradual movement towards private ownership of land. Between 1995 and 2014, the total area of protected lands increased by more than 20% and now covers 1,233,646 hectares. Much of this is community managed village-land forest reserves - over 140 of these reserves have been developed in recent years, covering many important habitats. In comparison, the state managed reserve network has not expanded much over the past two decades, and the forested areas within these lands have become more degraded - especially close to major cities. These challenges will only be solved if the right framework - from policy through to on-the-ground actions - is put in place. Building partnerships with global communities, national stakeholders and involving local communities could improve the effectiveness of managing forests and biodiversity, as well as supporting the country's development priorities.